One packet of Sugru contains either 4 or 8 sachets like this one. Do you remember when Blu-Tack was first invented? It completely revolutionised the way we stuck posters and maps and pics on the wall. Well, Sugru is somehow vaguely reminiscent of Blu-Tack, but it’s even better. It’s a kind of modelling-clay come glue which sets to the consistency of a hard rubber and which is so versatile that it can be used to mend almost anything. In fact, it enables us to fix problems that we didn’t even know we had! Sugru is made from silicone, but whereas silicone is sloppy when still wet, this stuff is almost as pliable as plasticine or Play-Doh. It can be rolled, squeezed, and moulded (using your fingers) to any shape. And whereas conventional silicone caulking doesn’t stick well to many surfaces, Sugru sticks to a whole range of things including paper, cloth, wood, leather, glass, ceramics, aluminium, iron, stainless-steel, brass, painted surfaces, fibreglass, perspex… Impressive, huh? It also sticks to some kinds of plastic, including PVC piping and melamine crockery, but it doesn’t get a grip on polythene/polyethylene or polypropylene. 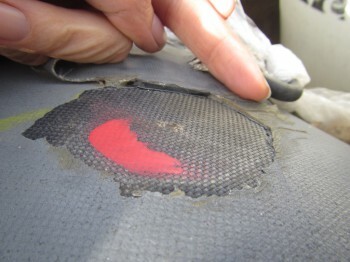 Sugru is a plasticine-like self-curing glue. Sugru was invented by an Irish woman called Jane who felt that the world needs fixing. That’s why it has such a weird name. It’s Gaelic, and it means play; and you say it, “Soo-groo”. Jane’s surname is Ní Dhulchaointigh, and I wouldn’t want to even begin to think about guessing how to pronounce that – so I’ll just call her plain Jane. She was studying product design at a university in London when it occurred to her that we shouldn’t be chucking stuff away when it breaks; we should be mending it. More than that, when we have ideas about how to improve something, or how to personalise it for our own needs, we should be able to do just that. Having had this wonderful but very ambitious idea, Jane then spent the next six years experimenting and testing and tweaking until she had a product which was mouldable, self-adhesive and self-curing.. And then she still had to persuade somebody to finance the production of the first 1,000 packs of Sugru. Having won the financial backing with which to go into production, Jane and her husband and their families then got together and spent an entire month packaging those first 1,000 packs of Sugru. At this stage they couldn’t afford to purchase the machinery which could have done the job in minutes. Their big break came with a rave review in the Daily Telegraph technology section. As a result of that, they sold those first 1,000 packs in six hours…! 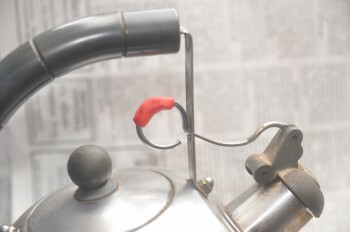 A few months later, Time magazine rated Sugru amongst the top 50 inventions of 2010. (The iPad was number 34, whereas Sugru was number 22…) and since then the company seems to have been on a journey to the stars. So, what can you do with Sugru? Where the blocks hit the deck they damage the paintwork, but padding 11 blocks would use a lot of Sugru. Well, you can’t use it to stick a camera mount onto your sit-on-top kayak. 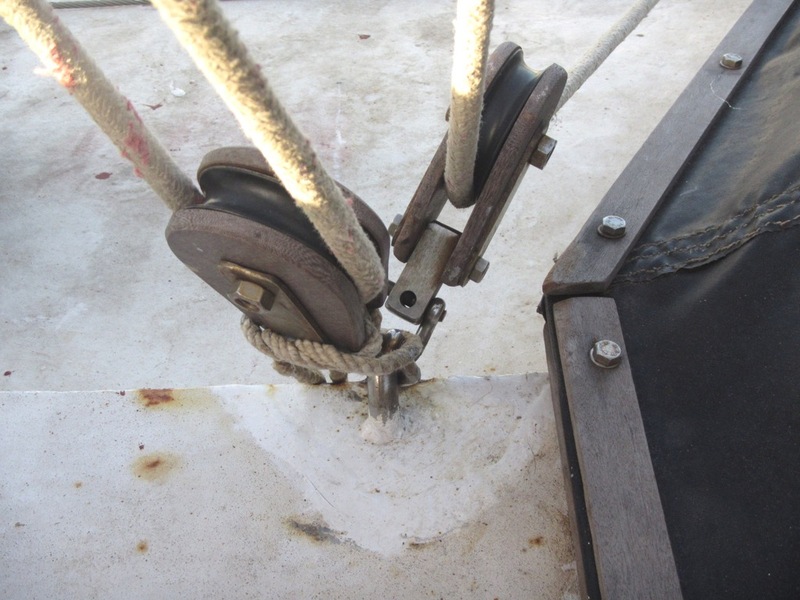 And unless you’re rich and prodigal you won’t be using it to make thick pads on the side of every block (= pulley, in land-lubber speak) so that they don’t bang on the deck and spoil the paintwork. Those were two of the things that I’d hoped to try, but the first was impossible, because the kayak is made of polyethylene, and the second was impractical because it would have used about three dozen sachets of Sugru. That apart, this stuff really does do what it’s supposed to do: it fixes almost anything. It can take temperatures as high as 180°C and as low as -50°C. It’s waterproof, dishwasher-proof, freezer-proof, UV resistant (which can be pretty important aboard a boat), and since it doesn’t conduct it can be used for electrical insulation. One of the few things it won’t handle is a naked flame. Yes, I could have used black Sugru – but then you wouldn’t have been able to see what I’m on about. Let’s begin with some items which are not unique to the yotting world but which we use on an everyday basis. Bluewater sailors wear flip-flops when we go ashore – they’re pretty much our only footwear – and flip-flops break. Well, Sugru is very good at mending flip-flops. It has no problem sticking to that particular type of rubber, and it’s strong. 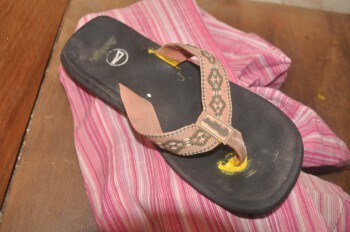 In fact, bearing in mind how easily the thongs pull out of a flip-flop one could even sugru them in from day one, before they break. We also cook, just like everybody else. And, as we have seen, Sugru is both heatproof and waterproof. So you can use it to stick the handle back on the saucepan lid – there’s a photo of just that “fix” on the Sugru website – and you can use it to insulate iron or stainless steel handles so that you don’t need to use an oven-glove when moving the pan. 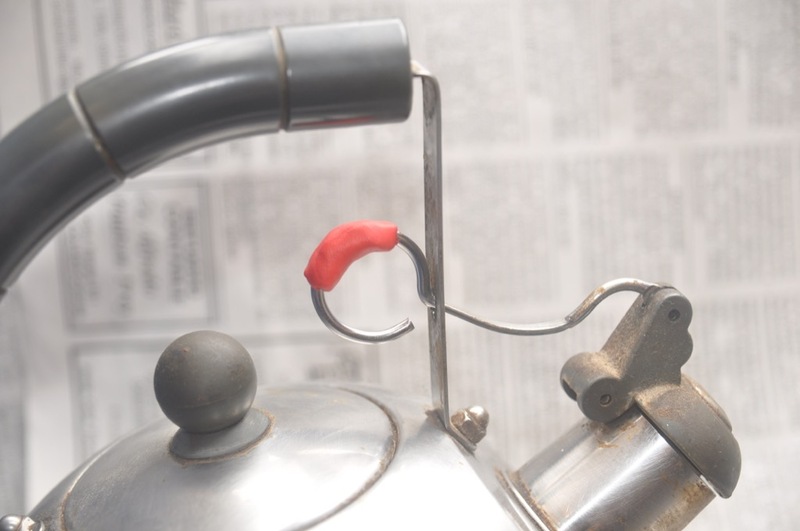 I’d been meaning for years to put a whipping around the pull-ring on our kettle’s spout – I used to burn my finger every time I poured the kettle – but with Sugru the problem was resolved in minutes. I subsequently insulated the handle on my iron casserole, but in this case I chose black Sugru, and I first rolled it between my hands to make a long, thin snake-like sausage Then I wound the snake around the handle. This presents a neater finish than the red blob; but they both work just as well. Sugru refused to have anything to do with the gasket on my oven door. Having had such success with my pots and pans I then tried mending a silicone oven glove. This glove is not very useful for getting stuff out of the oven but I use it for kneading scalding hot dough and for agitating the clothes when I use hot water dyes. Or at least, I used to use it until it split. Unfortunately the Sugru refused even to try to adhere – it just slid around – and thus I learnt that silicone doesn’t stick to silicone. 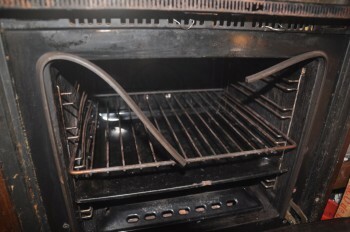 Next I tried to mend the gasket on the inside of the oven door. This piece of rubber tubing is designed to keep the heat inside while you’re baking, but the top section had fallen loose and was hanging down. 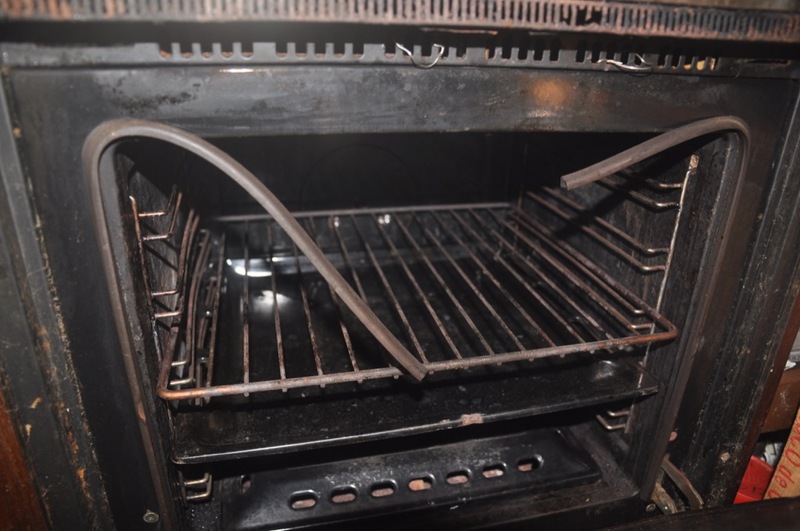 The oven obviously gets a lot hotter than 180°C – but I never got the chance to find out whether the Sugru was up to the task because, once again, it refused to stick. I deduce that the gasket must also be made from silicone. My next “fix” was one which will be of use not only to other cruising yotties but to anyone who likes to keep a store of dried goods in their abode. I store mine in old Coca-Cola bottles. We don’t actually drink Coke, nor any other form of fizzy drink – in fact, we wouldn’t dream of buying any form of food or drink which comes in a disposable plastic bottle – but you can always find these bottles littering the streets. Getting the beans into the bottles using a conventional funnel is not easy – they tend to jam up together in the neck – and so we’ve made a funnel from another bottle. 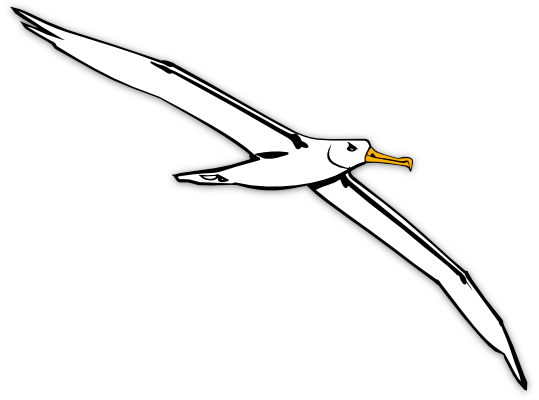 Mouth to mouth, the bottles form an hour glass shape; but, clearly, the bottle-funnel won’t just balance their atop its opposite number; the two of them have to be securely joined. This is achieved by cutting the top off the lid to the bottle funnel and then glueing the remaining ring in place upside down. 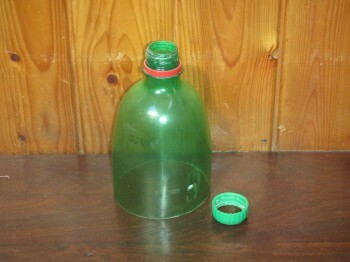 Now, the thread on the inside of the lid-ring can be used to fasten the funnel to the neck of the bottle which is being filled. So, where does the Sugru come into this? 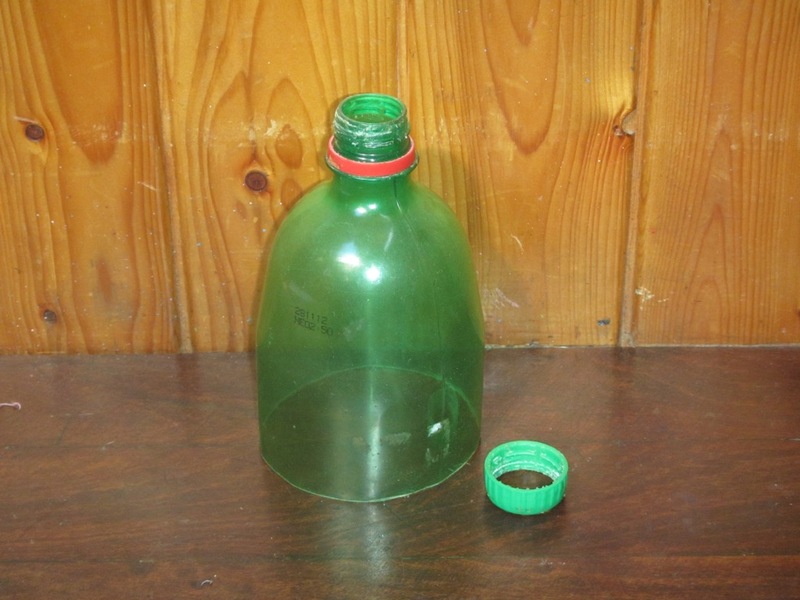 Well, the problem with the Mk1 bottle-funnel was that every time we used it, the lid-ring broke off. This is because the thread is too short to be shared between both bottles. 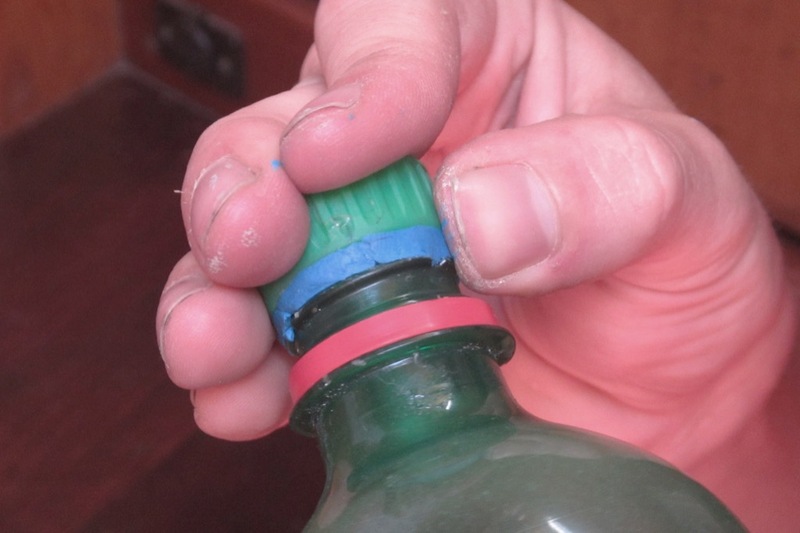 If we put more than half a turn onto the bottle being filled, the torque was sufficient to crack the epoxy glue. So the Mk2 bottle-funnel now features a lid-ring which is fastened in place with Sugru. I’m not sure how this will endure, because Sugru is not much happier about sticking to PET than it is to polyethylene – but it’s doing all right so far. 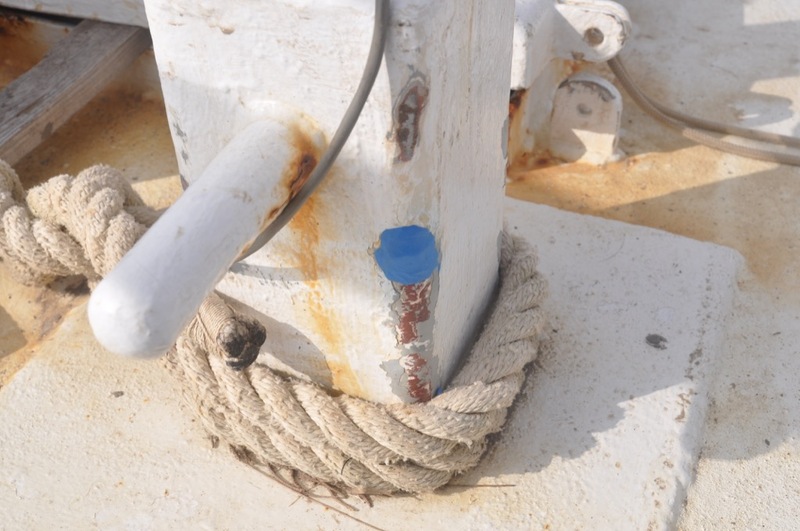 Another “fix” which is just as valuable ashore as aboard ship is the use of Sugru in mending or beefing up electrical cables. And Sugru is absolutely ideal for improving those fiddly little rubber-capped buttons which feature on modern electronics. 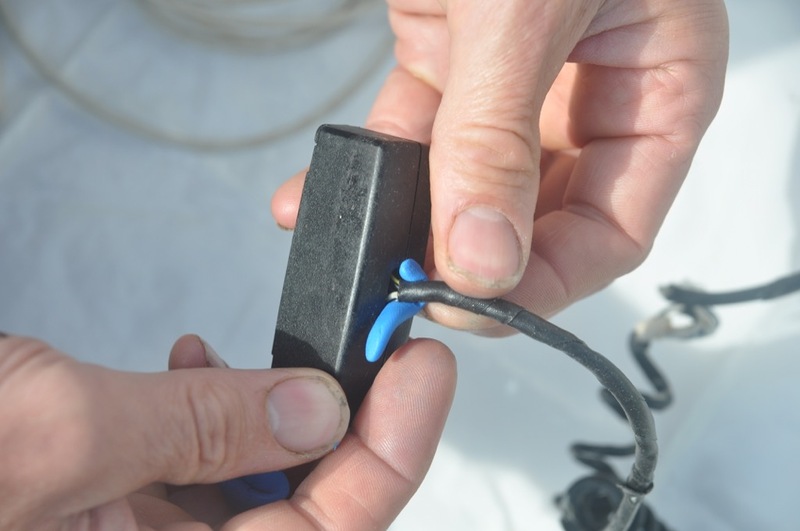 Our GPS was a real pain to turn on and off, but a tiny dob of Sugru resolved that. Moving on to things which appertain expressly to yachts and yachting – we used Sugru to mend the split in the diaphragm of a bilge pump. We’d already tried to bodge this up with Sikaflex, but that soon peeled off. We also used a couple of sachets of Sugru to glue the rudder indicator in place on the boss of the steering wheel. We used it to mend a hole in our old PVC sprayhood. It wasn’t frantically keen to stick to the PVC but persistent rubbing did the trick, and nine months later it’s still in place. 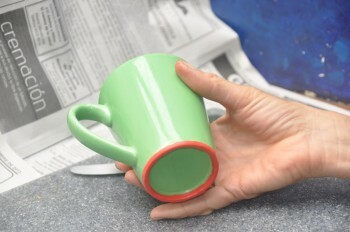 And we used it to create anti-slide rings on the bottom of a ceramic mug and a melamine plate. Because it’s relatively hard, Sugru is not so effective as the rubber used on the melamine crockery that you see in the poncy chandlers – but it’s better than nothing. 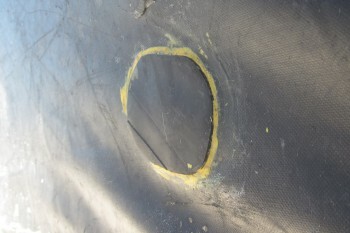 We also experimented to see whether Sugru sticks to terylene sail cloth – and it does. So far we haven’t needed to apply any patches, so I can’t say whether it would hold a repair together in a gale; however, I’m pretty sure that it would, provided the tear was first stitched together, in the usual way. It also sticks to our Decathlon oilies. I can’t say whether it would stick to the fancy Gore-Tex oilskins, but I imagine that it would. In anticipation of our journey south to Patagonia I had planned on improving the hood and collar of my oily with various spray flaps which were to have been held in place with velcro – and the velcro itself was to have been attached to the jacket with Sugru – but, of course, we’d run out of the stuff before I got my act together. This dob of Sugru was applied to the samson post 7 months ago. It hasn’t stopped the rust but it hasn’t fallen off either! Sugru sticks remarkably well both painted and rusty steel, but it doesn’t stop the rusted metal from continuing to corrode, so it’s not the answer to the lazy steel-boat-owner’s prayers… We still have to sort things out with chipping hammer, phosphoric acid and layers of paint. 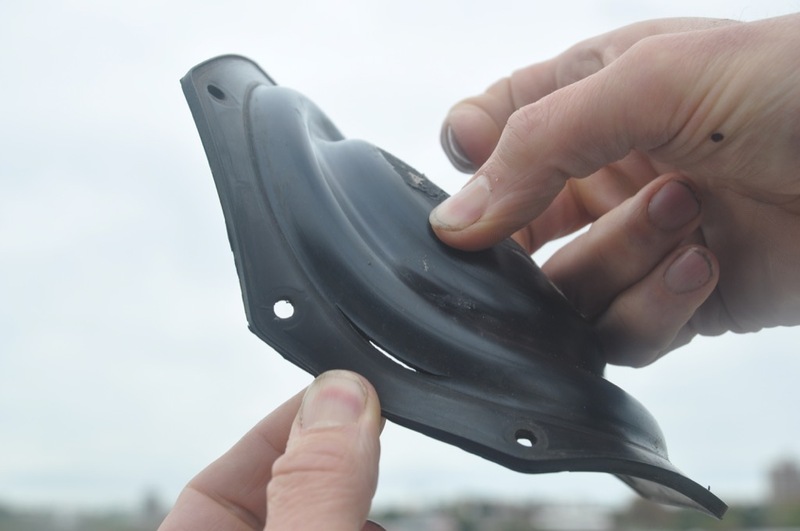 Still – you can use it to form a watertight seal around any through-bulkhead pipes, whether your bulkheads are steel, plywood, fibreglass or aluminium. And if I could think of anything that wanted fastening to the mast… Sugru would hold it there. Sugru isn’t cheap – a packet of 8 tiny little sachets costs £13 – so we avoided using it in situations where epoxy, Sikaflex, or some other sticky stuff would do the job just as well. One instance where it resolved a problem which these others had failed to solve was in the mending of a leak at the back of the sea-toilet. 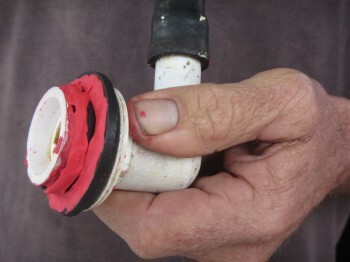 Here, the glue was required to stick well not only to the ceramic bowl but also to the adjoining PVC pipe and to a rubber gasket. It’s been on there for about 6 months now, and it hasn’t dripped a drop. 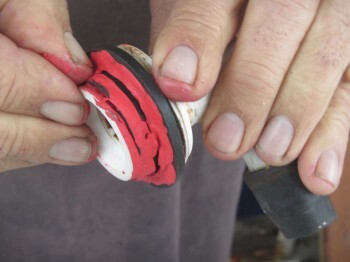 But our best discovery was the fact that Sugru sticks to hypalon – the fabric from which our dinghy is made. This is fantastic news, because the glue which is normally used for sticking patches onto hypalon is hard to find. And it doesn’t last for more than about six months in the tropics, so we can’t carry a supply. For the past five or six years we’ve been sticking the patches on with epoxy, but these patches only endure for about a year, and when they tear off they tend to take the surface of the hypalon along with them. Having got you all excited I now have to give you the bad news about Sugru. Firstly, it’s quite expensive. If you only want to stick itsy bits on your electrical wires and your electronic, this is not a problem, but once you start padding your camera with rolls of Sugru to make it drop-proof, or layering it onto your winch-handle to give it a better grip… Well, then it begins to hurt. The second problem is that it doesn’t have a very long shelf life. At the outset the shelf-life was only 6 months. The company have now improved the mix so that it lasts 13 months. They say that you can extend this to two years and more by keeping the stuff in the fridge – but we don’t have a fridge…. The final problem is that it’s not something that you’ll find on the shelves of your local supermarket or the ironmongers. You have to send away for it. Sugru is made principally from silicone and talc but also contains various other ingredients whose names are even harder to say than Jane’s. Of course, having heard about the stuff – and having heard about the price – we all want to make our own DIY version; but it’s not that easy. Over on the Instructables website you can find a detailed recipe for the manufacture of something called Oogoo. The inventor claims that it works in much the same way as Sugru, and since its only ingredients are silicone caulking and cornflour (Maizena) it costs a mere fraction of the price. We haven’t yet had the chance to test the Oogoo recipe, but even if it turns out well – even if it’s good for sticking patches on the dinghy and padding the sides of the blocks where they thump on the deck – I think we’ll still be buying a couple of new packs of the proprietary stuff. Messing about mixing silicone and flour is all very well if you want a big batch, but if you only want to dob a dot on a fiddly switch – or if you want to mend something in a big hurry – Sugru is a lot more convenient. 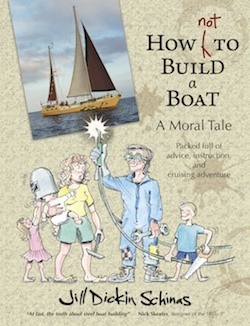 And now that the shelf-life has been increased it would be worth keeping some in the grab bag, or even in the liferaft itself, for emergency repairs . I checked yesterday the fridge if the Sugra bags I got years ago were still there. In spite of being in the fridge as advised to extend somewhat their expiry date they have passed that day long time ago. I most often use VHB-tape for what Sugro (or the much cheaper but stiffening up harder”Milliput”, ‘plumber’s putty or UniBond Power Putty) could be used. That VHB-tape is double sided is an advantage as it sticks onto itself and as it is rubbery can with some fingerwork ‘melted’ into each other. Ideal to strengthen cable endings prone to rougher handling etc. The outside of the tape (made into a putty) stops being sticky just because of dust clogging onto it. A roll of VHB-tape goes a very long way and has plenty of applications. Much cheaper than what I paid for these tiny Sugro bags and with no expiration date. In the days I got my roll it only come in grey however.